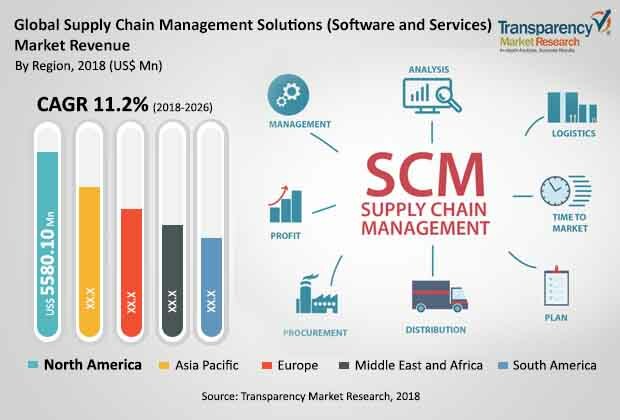 According to a new market report published by Transparency Market Research, the global supply chain management solutions (software and services) market is expected to reach a value of US$ 32,908.2 Mn by 2026 on account of exponential growth in supply chain management solutions (software and services) modules. The market is projected to expand at a CAGR of 11.2% during the forecast period from 2018 to 2026. The expansion is attributed to rising demand for advanced supply chain management solutions (software and services) in industries and increasing adoption of on-premise deployment models to offer the finest services to the clients. In the supply chain management solutions (software and services) market, North America is anticipated to be a rapidly expanding region, followed by Asia Pacific, Europe, Middle East & Africa, and South America during the forecast period. Further, the supply chain management solutions (software and services) market is at an emerging stage and is anticipated to expand rapidly during the coming years. Expansion in the e-commerce industry along with rapid delivery of goods in order to gain competitive advantage have led to high demand for supply chain management solutions (software and services) systems. This, in turn, offers opportunities for key vendors to develop solutions focusing on the retail or e-commerce industries. For instance, Vinculum Solutions, an India based company, focuses on delivering solutions (Vin e-Retail WMS) and products specific to the retail industry. The company’s solutions support easy order delivery; last mile delivery; and integration with manufacturers, logistics companies, and web stores such as Amazon, Flipkart, eBay, Lazada, and Snapdeal. Online sales channels are becoming more complex and are encouraging manufacturing businesses to adopt supply chain management solutions (software and services) software. This is expected to propel the supply chain management solutions (software and services) market in the coming years. Emergence of e-commerce has led to rise in adoption of supply chain management solutions (software and services) solutions. The e-commerce industry is offering new opportunities to companies such as FedEx in the area of logistics. The supply chain management solutions (software and services) market can be segmented based on deployment, industry, and enterprise size. According to the research study, the global supply chain management solutions (software and services) market is dominated by the food & beverage industry, which held a significant market share in 2016. This is due to rise in requirement for and higher adoption of supply chain management solutions (software and services) in the food & beverage sector across the world. The food & beverage industry is increasingly adopting supply chain management solutions (software and services) to understand changing consumer preferences, minimize risks, and reduce costs, which leads to improved productivity of businesses. Further, industries such as transportation & logistics, automotive, and industrial are also showing high growth in this market. In terms of deployment, the on-premise segment held a prominent market share in 2016 and is expected to continue its dominance over the forecast period. North America led the global supply chain management solutions (software and services) market with a substantial market share in 2016. This is primarily due to increasing adoption of supply chain management solutions (software and services) to increase productivity and to improve logistics services. The North America supply chain management solutions (software and services) market is expanding at an exponential rate. The supply chain management solutions (software and services) market in Asia Pacific, Europe, Middle East & Africa, and South America is expected to expand at a rapid pace during the forecast period on account of new opportunities. The research study includes profiles of leading companies operating in the global supply chain management solutions (software and services) market. Key players profiled in the supply chain management solutions (software and services) market include Aspen Technology, Inc., Comarch, IBM Corporation,, Infor, Inc., JDA Software Group, Inc., Kinaxis, Oracle Corporation, Plex Manufacturing Cloud, QAD, Inc., Sage, SAP SE, and Vanguard Software.